So, what IS the story on Wave Cannon® version 2.0, or as we’ve decided to call it, the Wave Cannon MKII Superdistorter? The long story short is that this thing is an unrepentant, unapologetic distortion pedal that is totally nasty and fun. This Cannon comes pre-loaded with balls (pun alert!) and is capable of going from cranked, lightly dirty amp tones to the sound of a furry Godzilla devouring a junkyard full of broken a/c window units. It’s different than the original, which was based on the classic ’70s fuzzstortions we grew up playing. It’s different from our Haymaker™, which is a wide range drive pedal based around the rotation of a clipping network into different locations in the circuit, and which is intended to respond and feel like an extension of your amp. This pedal is really about rocking your socks off. 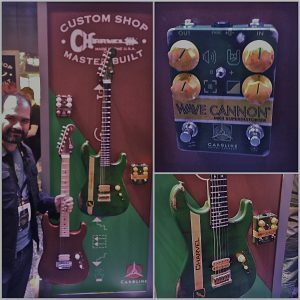 While it can do some extremely cool mild-to-medium crunch tones, Wave Cannon II is really capable of overwhelming your amp. The focus (mids) and tone controls are different from what we’ve done before and can give you a really broad range of textures and voicings. There is a LOT of gain and volume on tap, as we’d been infuriated in the past by great sounding classic distortion pedals we’ve owned that didn’t go far enough with clean amps, or were quieter than unity gain or the bypass signal. The rumble switch allows more low end if you want it, or lets you tighten things up if you don’t need it. “The MkII breathes fire with voicings that run from a sharp, articulate grind to a bottom heavy sludge, and all with a few twists of a knob and a flip of a toggle.” To read the excellent Gearphoria review of Wave Cannon MKII, click here. For a taste of what we’re going for, enjoy a perusal of our Wave Cannon MkII manual. 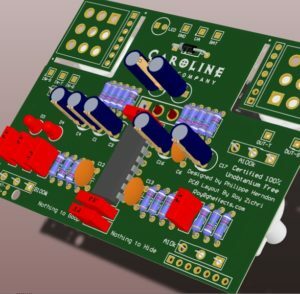 As per all Caroline pedals, WC MKII runs on standard industry 9V DC power supplies and features true bypass switching. It is a good pedalboard citizen that plays well with others. 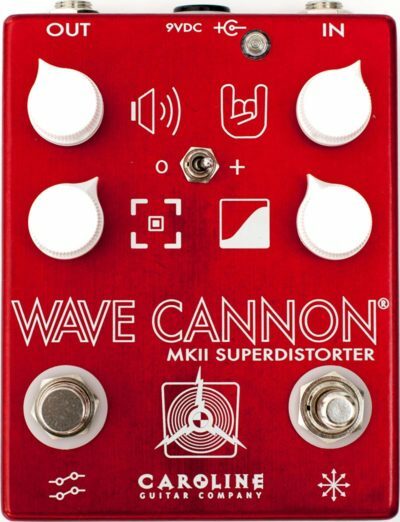 Not sure which Caroline drive pedal to get, Haymaker, Cannonball, or Wave Cannon 2? Check out this handy explanation. Special thanks have to go to some good industry friends of ours: Roy Zirchi (Greenhouse Effects) for some gorgeous and very professional PCB layout work that will allow us to continue making this great pedal by hand, Austin Ziltz (Coldcraft Effects) who talked me from a figurative ledge when I’d missed something in this circuit that vexed me, and to Marc Ahlfs (Skreddy Pedals) for sharing a component value suggestion that made a big difference in this pedal. I hope you’ll check out their wares and consider supporting their work as you’ve supported ours.